Towson impressed in four games this past week, toppling UNC Wilmington 4-3, Delaware State 5-1, Drexel 4-3 and UMES 7-0. On Sunday, the Tigers (10-11, 3-1 CAA) first faced off against Drexel (9-9, 1-3 CAA) and stole the doubles point after a win from senior Yevgeniya Shusterman and sophomore Alexa Martinez. Towson stumbled during the singles matches, but freshman Phoebe Collins’ straight set win kept the team in contention. Haliou’s hard-fought three-set match win gave Towson the singles point and a 4-3 victory over Drexel. Then, the Tigers faced off against the University of Maryland Eastern Shore (0-9, 0-4 MEAC). The doubles team of senior Lucy Gloninger and junior Claire Bedi won in a decisive 6-0 match, and the freshman duo of Amelia Lawson and Jessica Assenmacher won 6-3 to nail down the doubles point. The Tigers were up 2-0 going into the singles matches due to UMES being down a player. Bedi, Glonginger and Martinez all defeated their opponents in straight sets. Freshman Mia Douglass rounded out the singles play for the Tigers with a straight sets win to give Towson the victory over UMES. On Friday, the Tigers persevered to defeat UNCW (8-10, 2-2 CAA) for the first time in the team’s history. “Huge conference win for Towson over UNCW,” Peterson said. “Lots of adversity, but we overcame it as a team. Collins and Haliou took a 6-1 doubles victory, but the Seahawks ultimately won the doubles point. 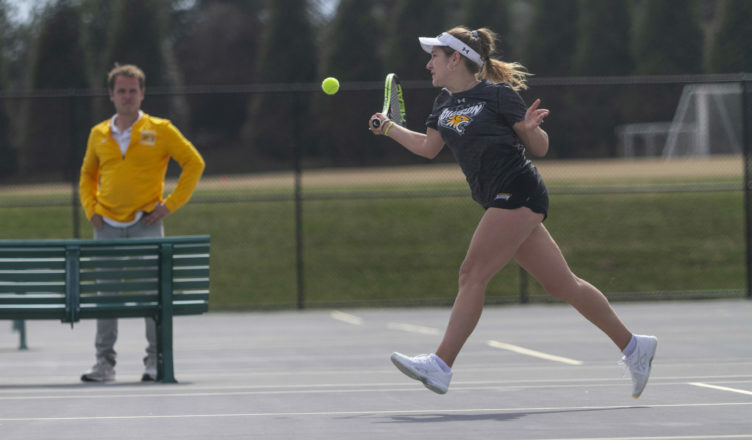 Lawson and Shusterman both clinched singles points to keep Towson in contention. Collins and Gloninger proceeded to win their singles matches, giving Towson the victory. Against Delaware State, the match consisted of only singles games, and the Tigers performed well. Shusterman won the first match in straight sets 6-2, 6-2, followed by a win from Collins. Bedi also collected a straight sets victory 6-2, 7-5. Assenmacher pushed through to win her match in three sets as Towson took the win. Next, the Tigers will host the Villanova Wildcats on Tuesday, April 9 at the Towson Center, followed by a trip to Newark, Delaware to take on the Delaware Blue Hens on Wednesday, April 10. Both matches are slated to start at 3 p.m.